We have arrived in Forest City, Iowa, home of Winnebago Industries. We'll be here for a couple of weeks (at least) to attend Winnebago's Grand National Rally and have some warranty work done. Wifi is sketchy. We'll post when we can. 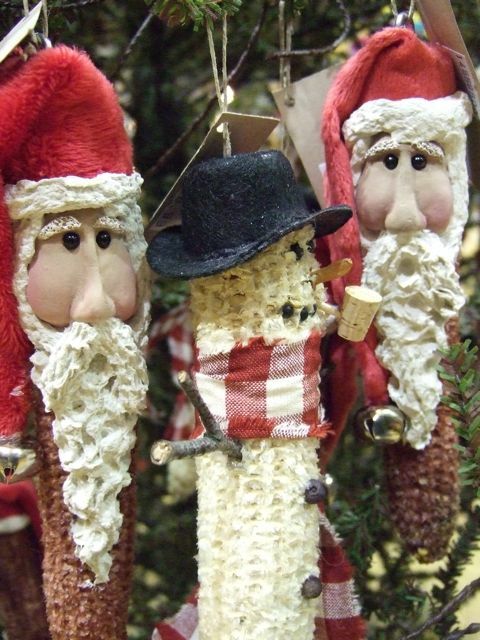 Meanwhile, Bullwinkle is having a great time hanging with his peeps. Sometimes an overnight stop turns into three. 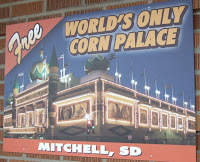 And, such is the case for us in Mitchell, South Dakota. After a long drive here Monday we were definitely ready to stop and rest. We liked R&R Campground so much we decided to stick around for a couple more days. Had we only stayed one night we would have missed this! 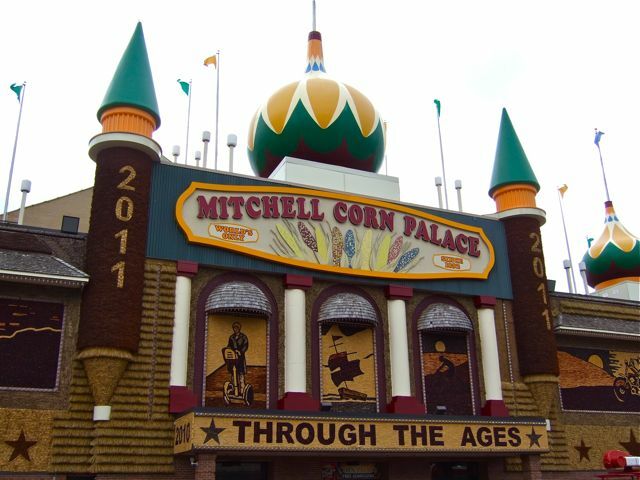 The Mitchell Corn Palace is the town's number one tourist attraction. We'd heard about it, of course, but had never laid eyes on American's only building with a corn facade. 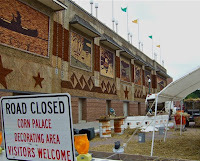 About 275,000 corn cobs and more than 3,000 bushels of rye, milo, oat heads and sour dock adorn the palace, which has stood here on Main Street since 1892. 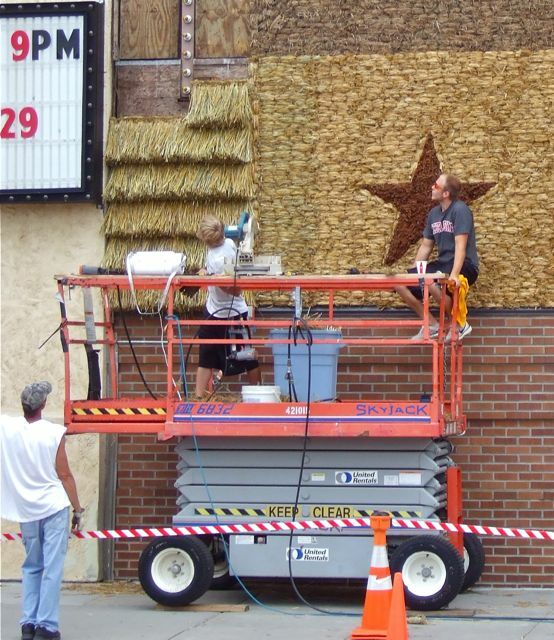 Every year the exterior is replaced with new decor reflecting a theme. 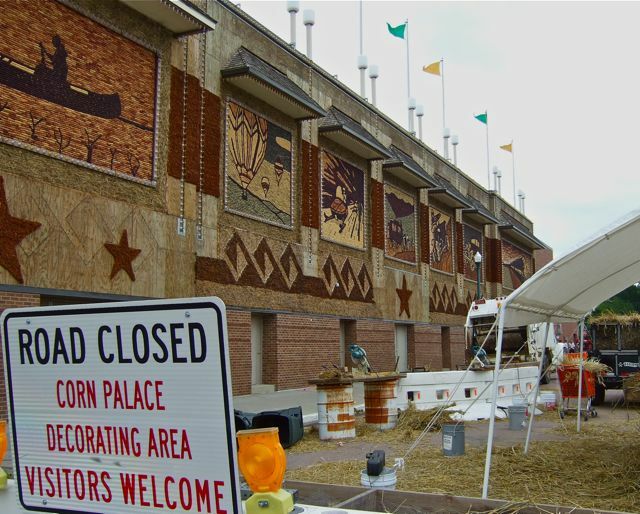 This year's theme is "Through the Ages", and the corn cob murals reflect a variety of modes of transportation. We looked, but we didn't see an RV on the place! 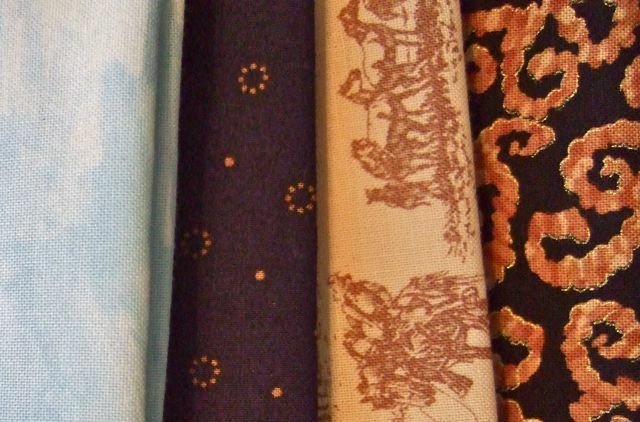 The redecoration process starts in June. The first process is to replace the dock and rye, which was happening today. 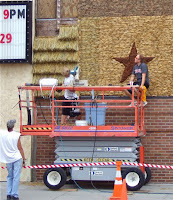 The murals will be replaced during the Corn Palace Festival in August. 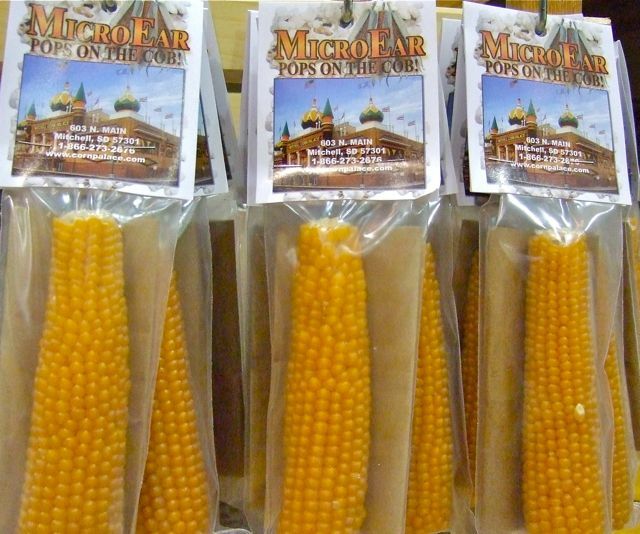 At a gift shop across the street visitors can touch "actual Corn Palace corn". Yep. 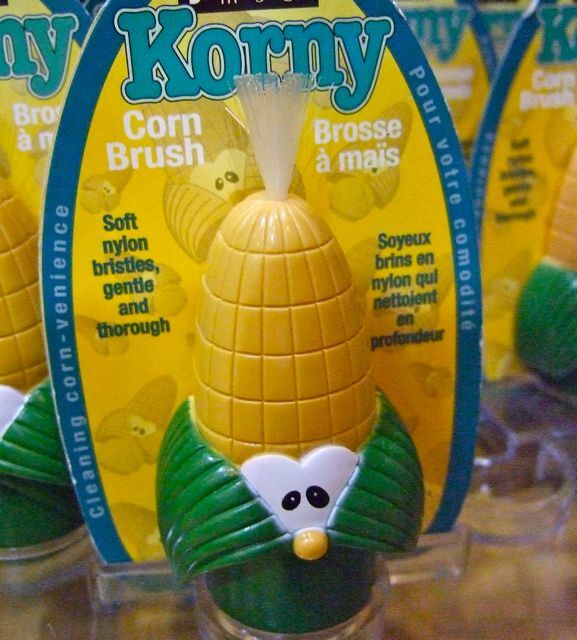 It looks and feels like real corn to us! 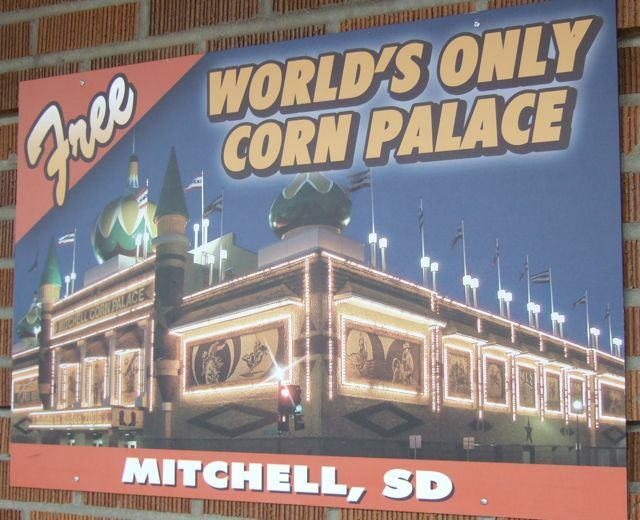 Admission to the world's only corn palace is absolutely free. So, of course, we stepped inside. 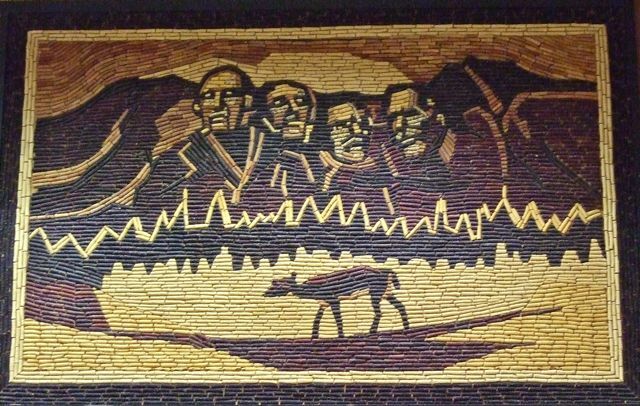 The Corn Palace serves a community venue for sporting events, concerts and such. Today, it was a cool place to beat the heat! Inside there are more murals. 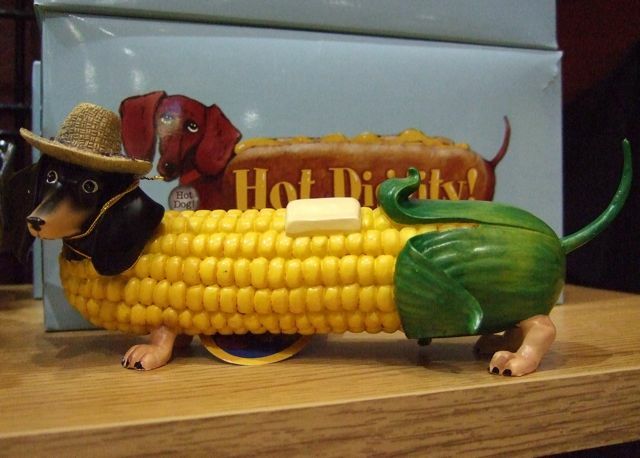 We found this corn cob interpretation of our last destination. Interesting. 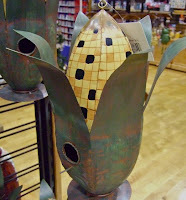 There were more gift items available for sale inside. 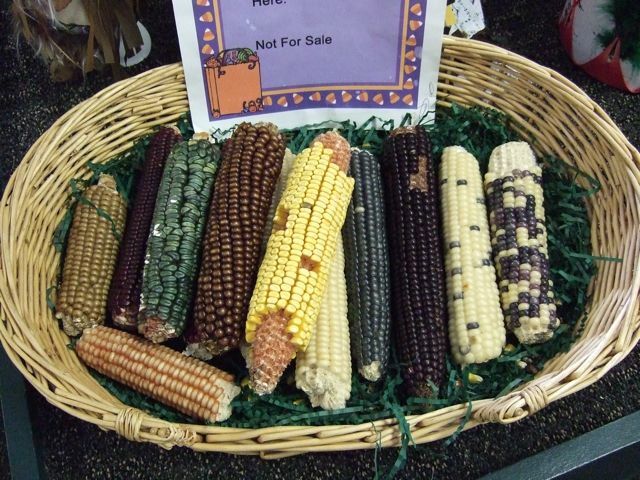 And, of course, many of them have something to do with corn. 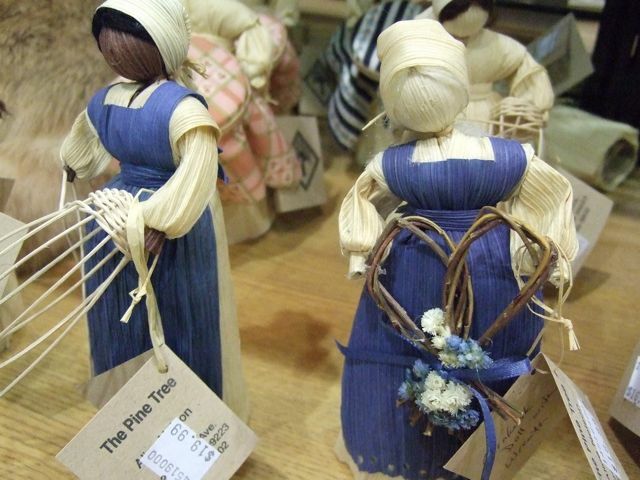 These corn husk dolls were cute. 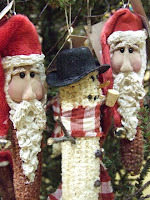 These corn cob Christmas ornaments had me chuckling. 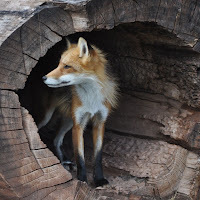 There was a whole tree full! 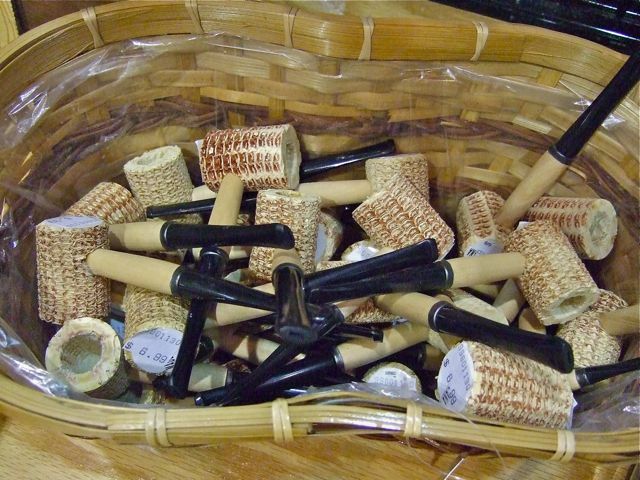 And, what would a corn palace be without corn cob pipes? 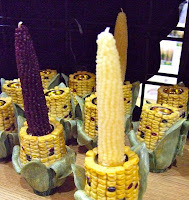 There were all kinds of corn decoratives, like these candle holders. And, yes, that's right. Those are corn cob candles! Doesn't every bird want a house shaped like an ear of corn? I'm not exactly sure what this is about. But, by now I was really laughing. This place is a hoot! 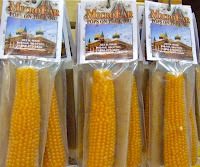 and this microwave popcorn that pops on the cob. 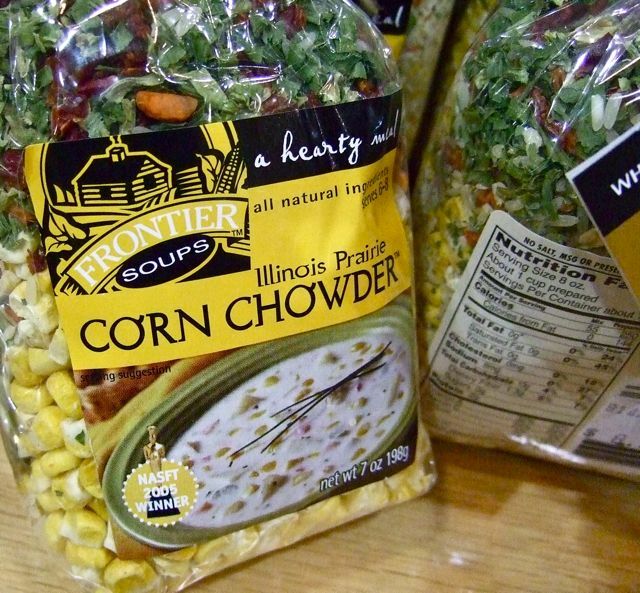 There's corn chowder, too. But, this stuff was made in ILLINOIS! 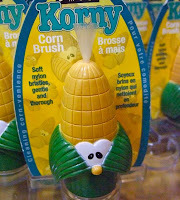 And, there were lots of little gadgets to make fixing and eating corn a bit easier. Yes, it was all pretty corny! 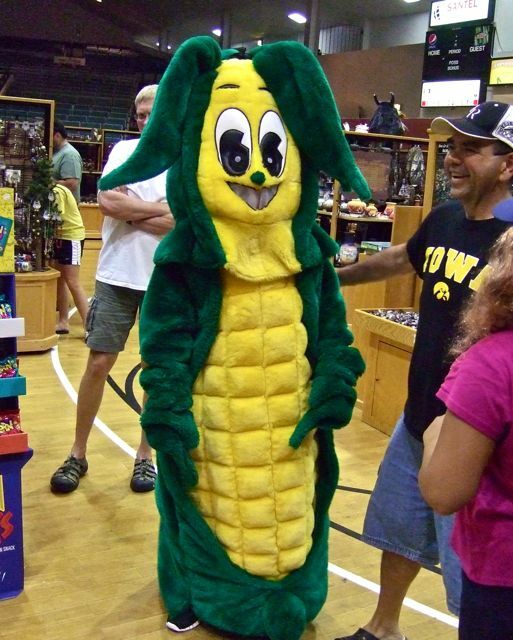 Yep, Mitchell is very proud of corn. 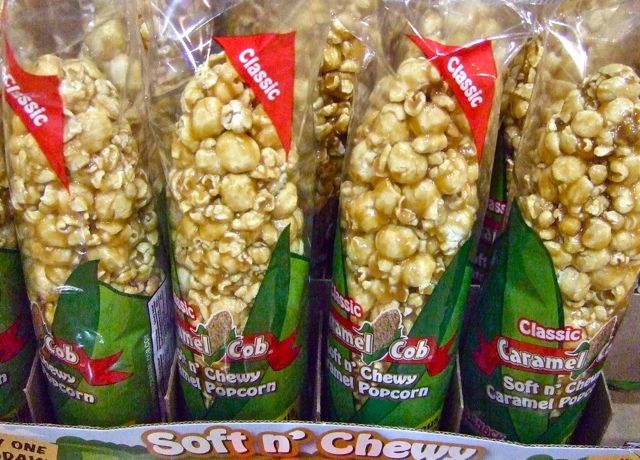 The high school athletic teams are the Kernels. (tee hee!) As we were getting ready to go we were visited by the town mascot, (Get ready for it!) Cornelius! If you find yourself cruising along I-90 and you come upon Mitchell, take a break and check out the corn palace. 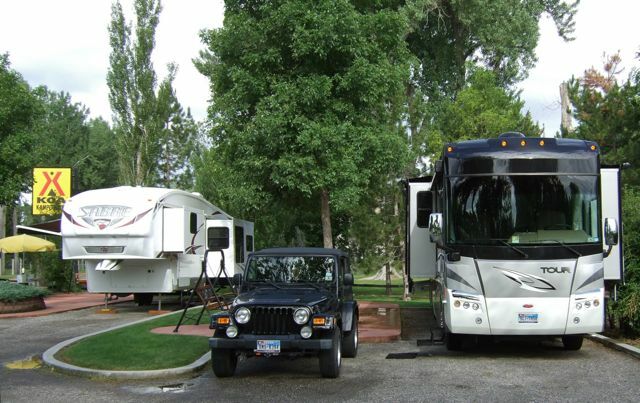 There's plenty of parking, even for RVs. And, go inside and look around. It's definitely good for a laugh. And, who knows, you might just decide to stick around for a couple of days! After three fun nights in Mitchell, we're taking our moose home tomorrow...to the booming metropolis of Forest City, Iowa. We're back on the road this morning. Our visit to Hill City was fun, but far too short. Crooked Creek Resort provided us a lovely creekside spot to kick back, relax and enjoy some time with family. After yesterday morning's wet tour of Mount Rushmore, we waited for things to dry out and let our nieces pick the afternoon's activity. They chose Bear Country USA, a drive-through wildlife park between Hill City and Rapid City. 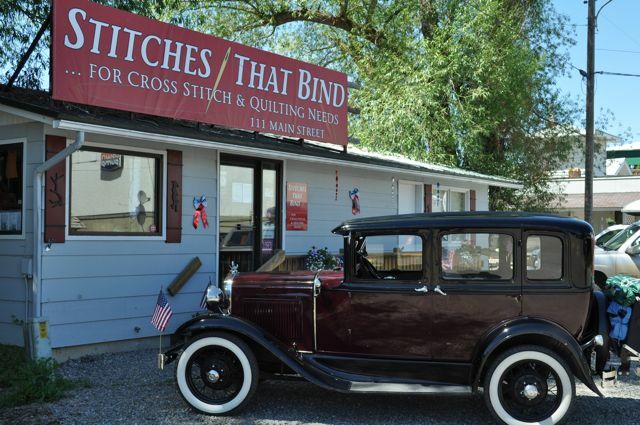 This isn't the kind of place we'd choose to visit on our own, but we were happy to be along for the ride. When we made the first turn and saw this herd of elk lounging in the tall grass, we all thought this place was pretty cool! 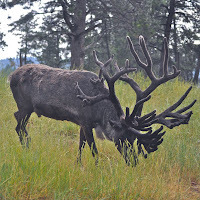 The reindeer were very comfortable around our minivan and came very close. 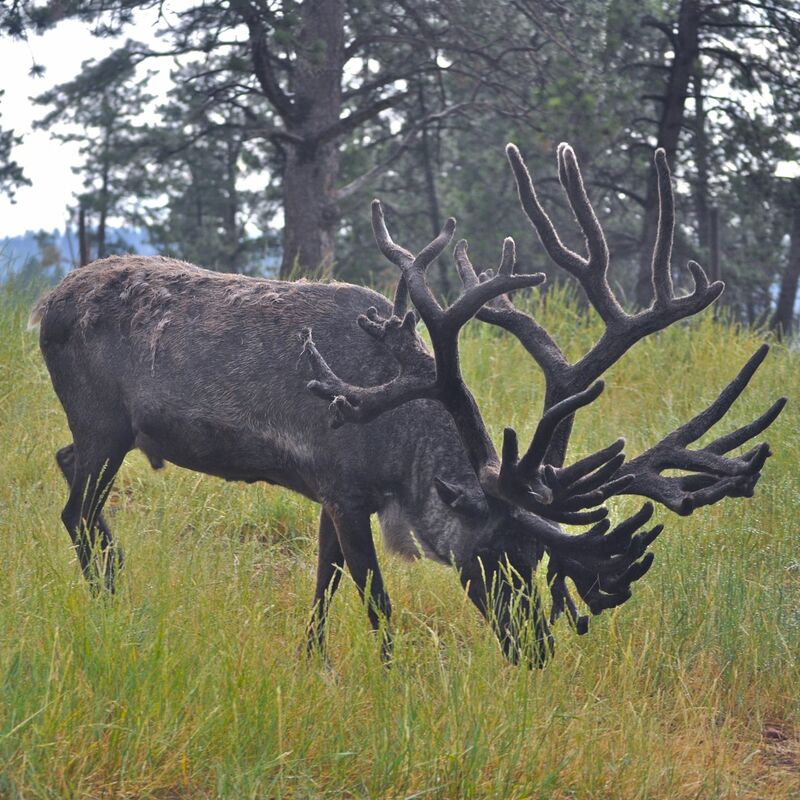 This guy had one impressive rack! 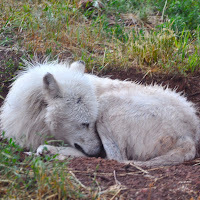 This Arctic fox was enjoying a peaceful afternoon nap. 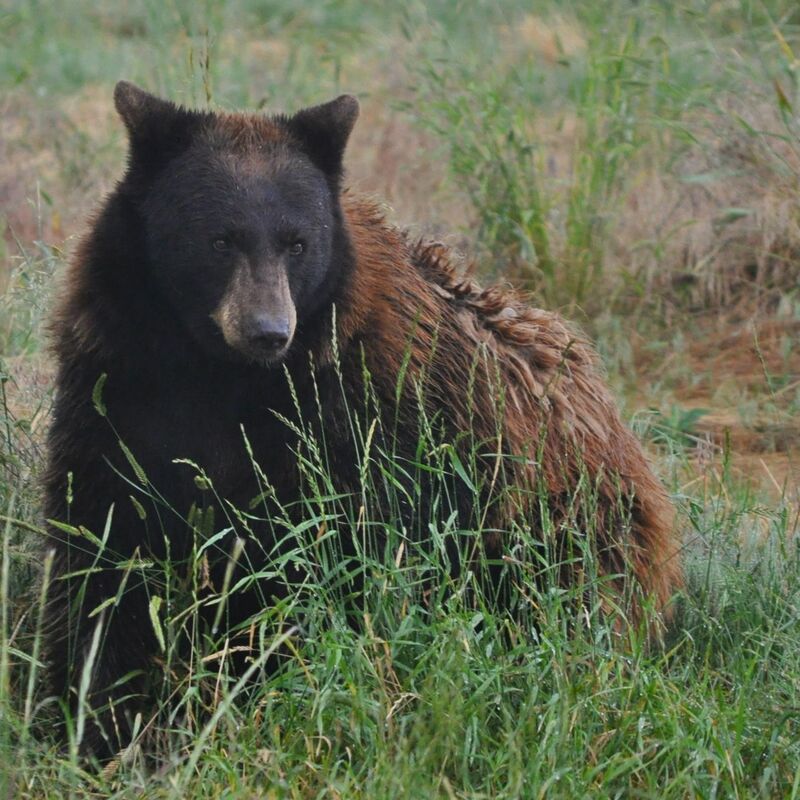 The bear habitat was large with many big, burly residents. This guy was one of the first we saw. We got out of the car to see the small animals and babies. 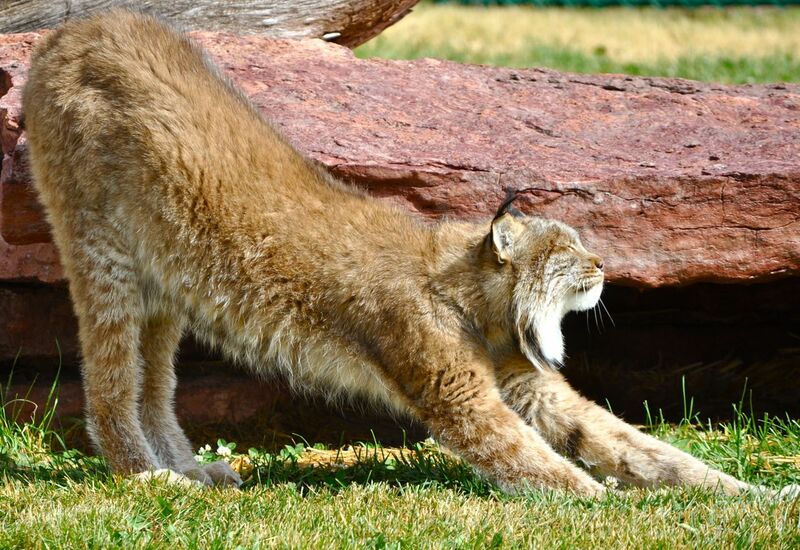 This lynx stretches just like our kitties! 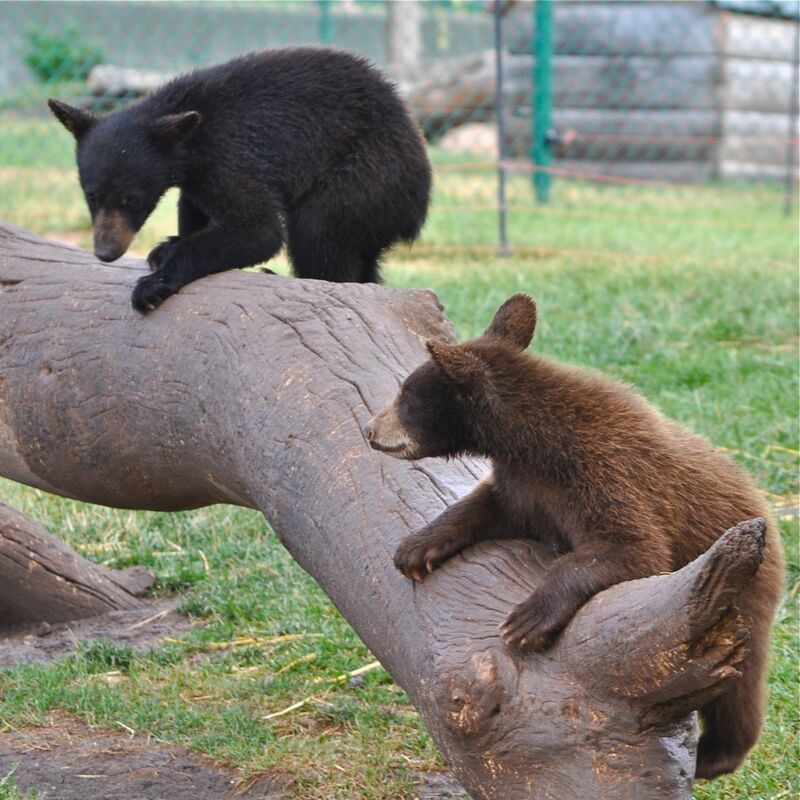 The bear cubs were fun to watch, and very busy! They just wouldn't stay still for a picture, but we were able to catch these two cuties in action. That is one cool looking coyote! We were pleasantly surprised how much we enjoyed our tour. 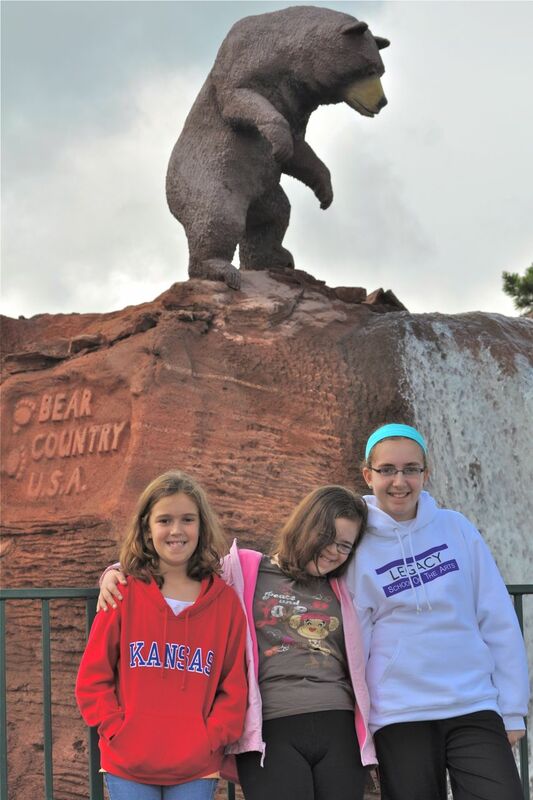 And, by the looks on the faces of the three that picked the place, we think they had a good time, too. 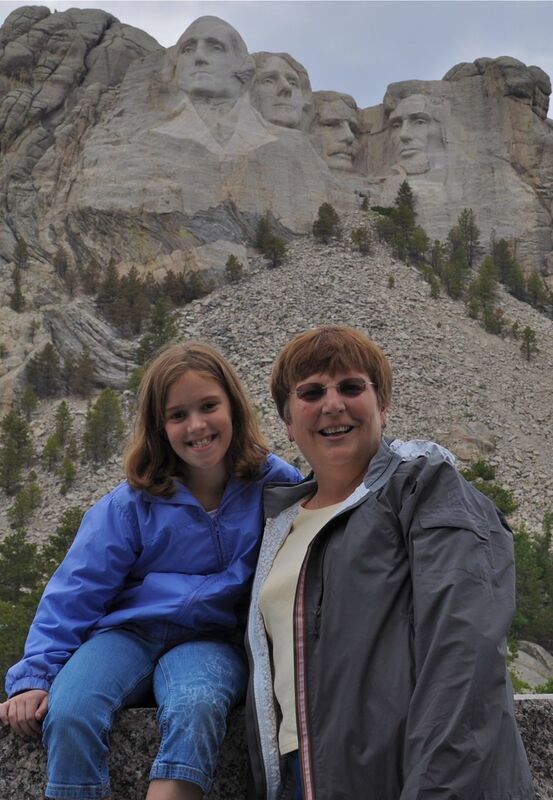 Our first morning in Hill City was beautiful, so we decided to scout out the Mount Rushmore National Memorial. These 60-foot tall faces in granite are awe inspiring. 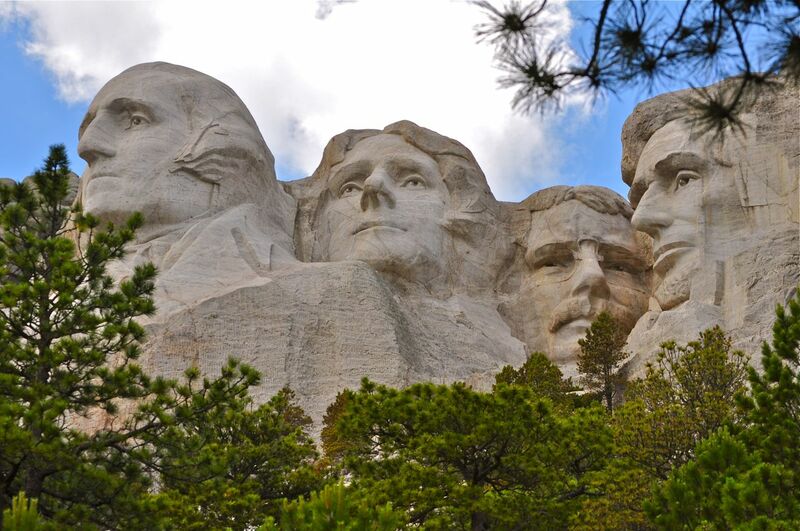 It's really something to take in not just the work of these four American Presidents over the first 150 years of our country's history, but also the sheer scope of this magnificent work of art and craftsmanship. Truly awesome. 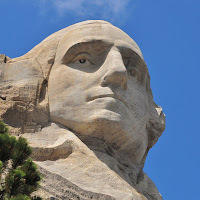 Paul and I took the Presidential Trail for some up close and personal looks at George and the boys. 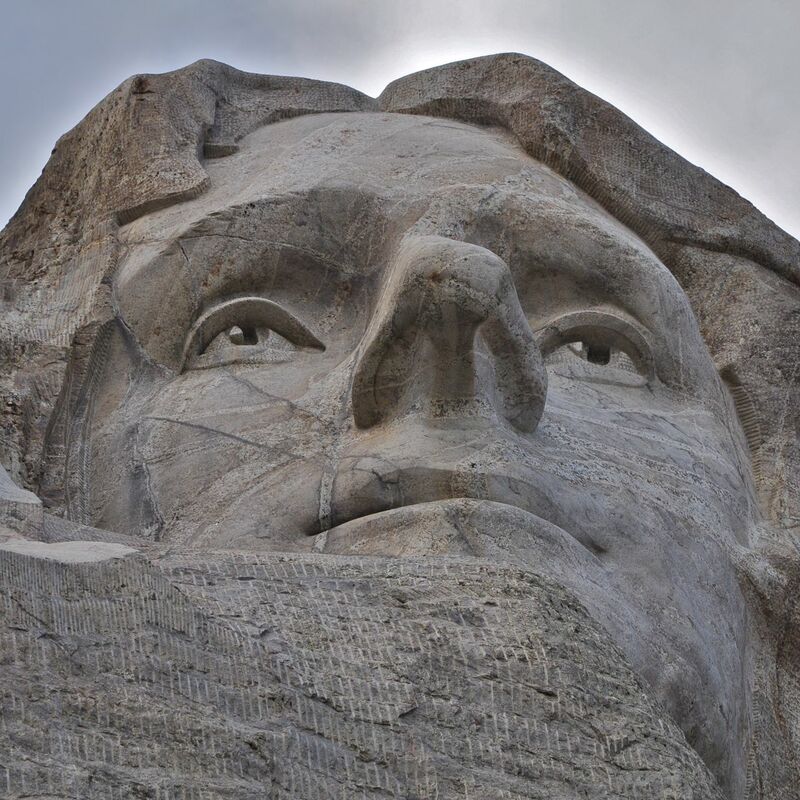 Taking in the view of Jefferson, several people commented that we were looking up his nose. Well, we sure were! One of the most fascinating features of Theodore Roosevelt's sculpture is his eyeglasses. Such fine detail in stone. And, that mustache looks very realistic! The face of Abe Lincoln is serious and soulful. Look at those eyes. How did they do that? 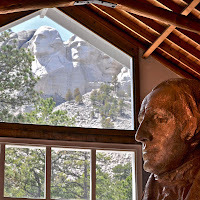 An interesting spot on the trail is the Sculptor's Studio. 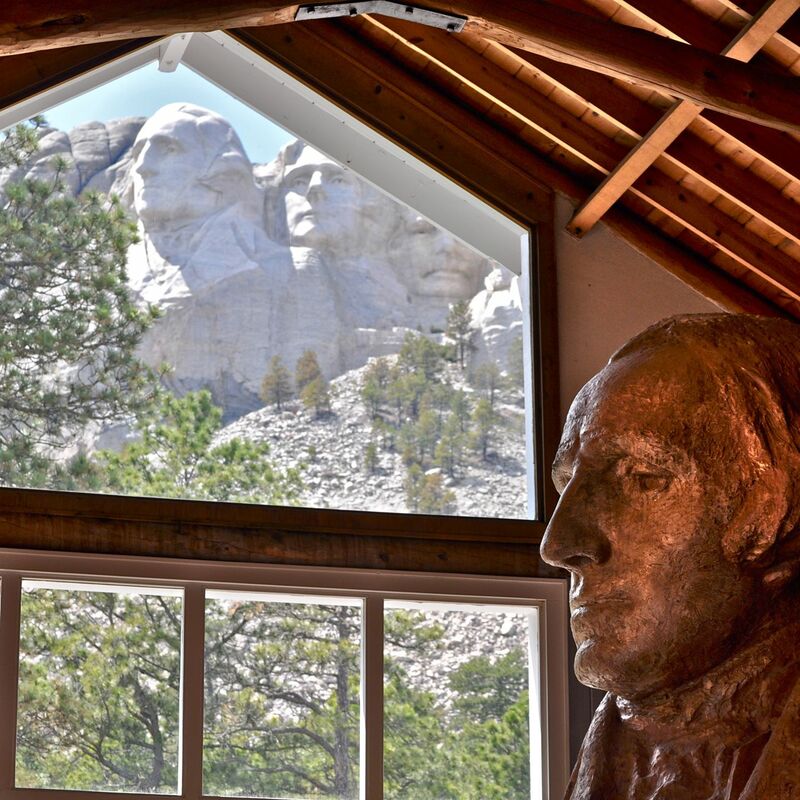 Inside stands a model depicting the original design of the monument. 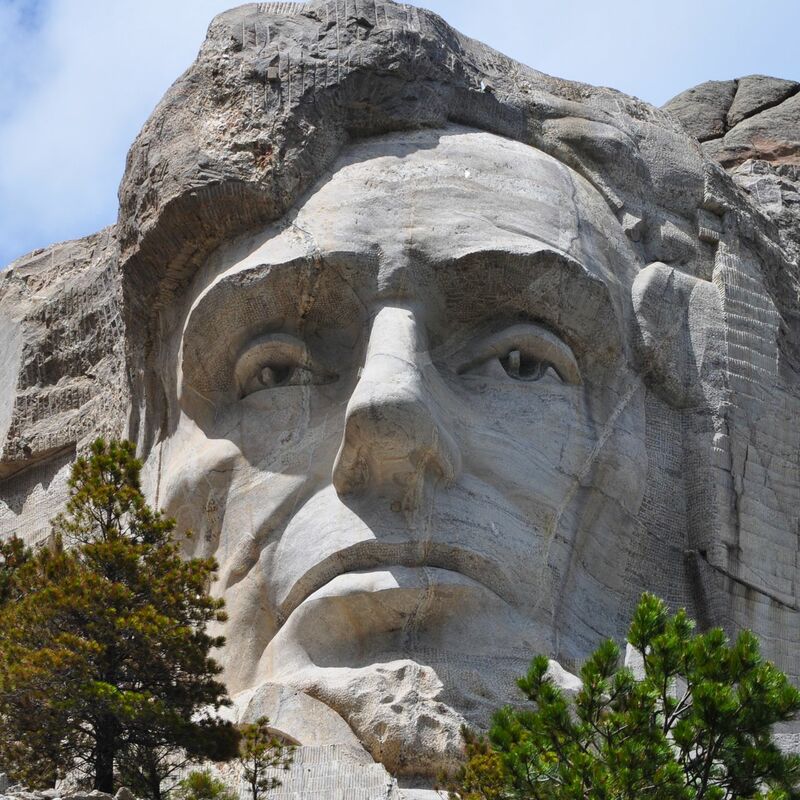 As the ranger (who looks quite tiny here) explained, the carving ended prematurely when federal funding was cutoff in 1941. The model in the foreground and the finished work in the background. As we headed back toward Hill City we stopped at the Profile View turnout and caught this last glimpse of Washington. Yesterday we made a return trip to the memorial with Paul's brother and his family. 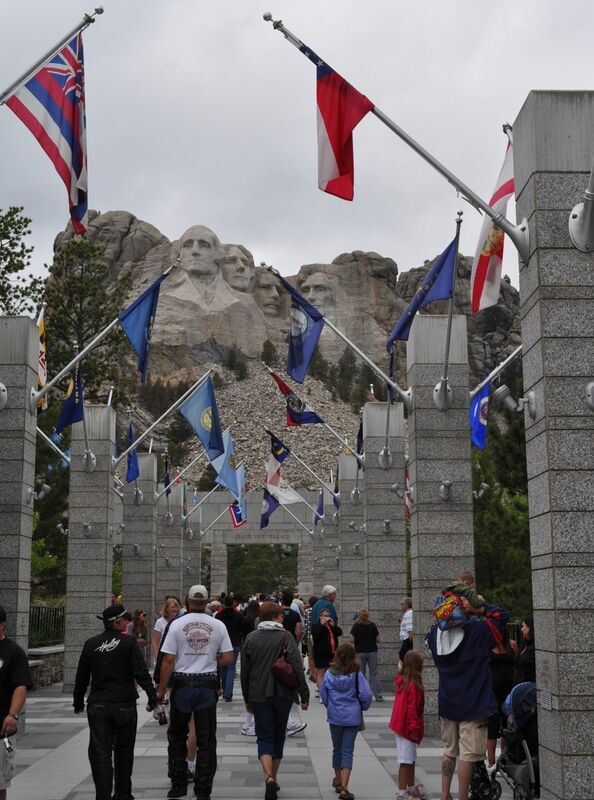 We enjoyed looking at all of the state and US territory flags on the Avenue of Flags. 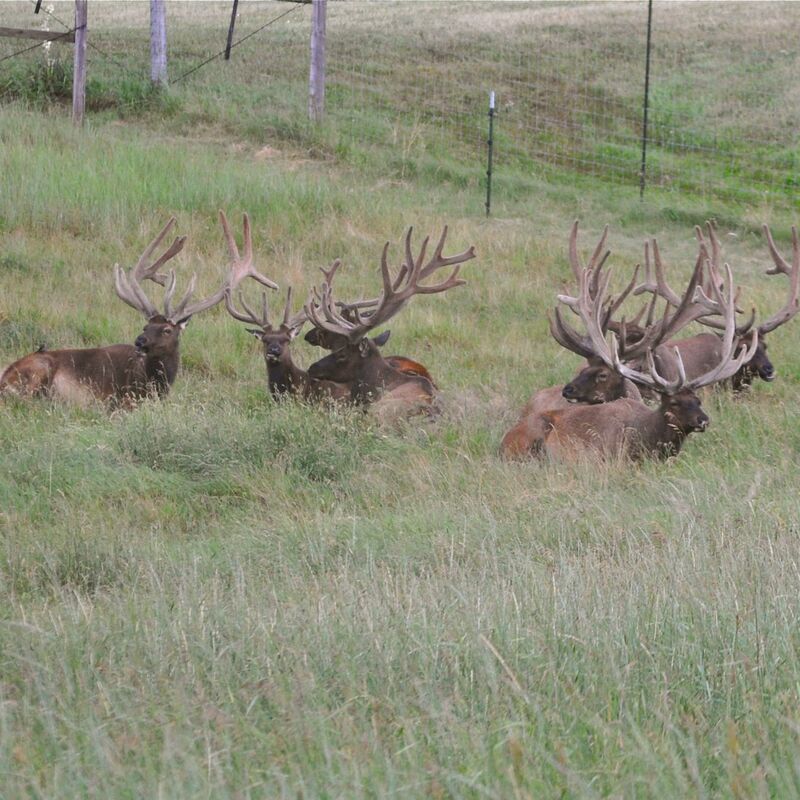 We lined everybody up and shot 'em! 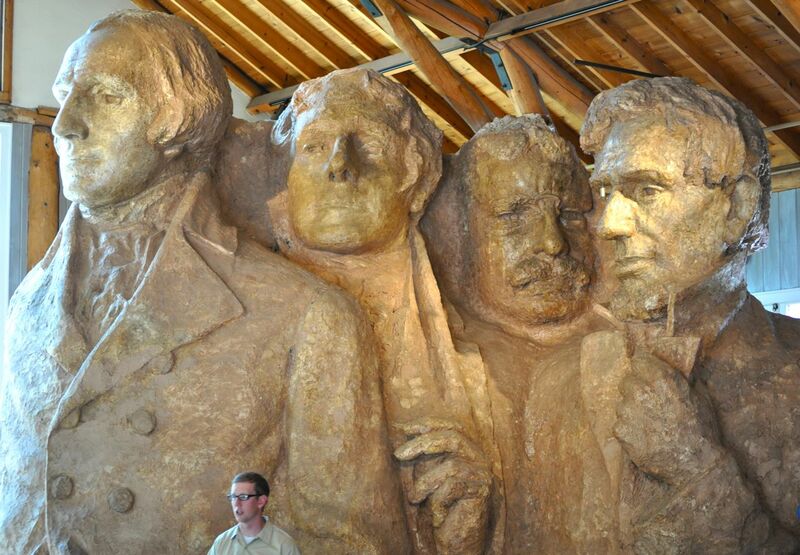 Here you see four Presidents and two Marys! While we were in the Visitors Center the clouds opened up and the rain poured. 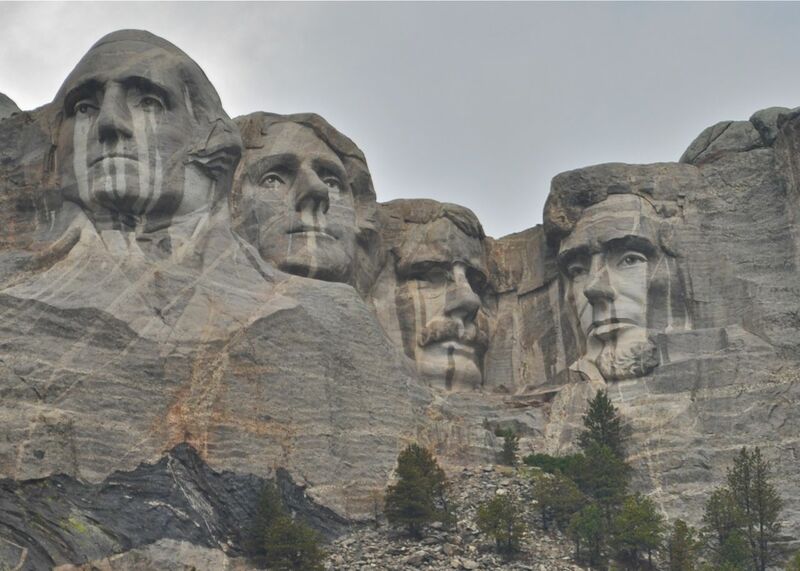 The four gray faces looked rather tearful. A couple of them looked like they could use a Kleenex! 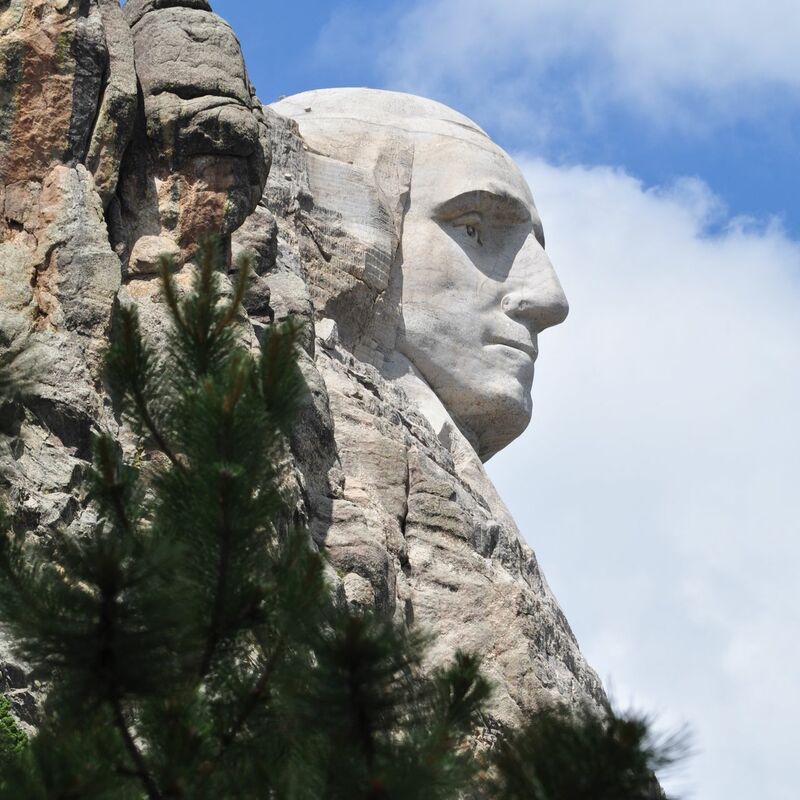 No matter what the weather, Mount Rushmore is one of those can't miss places to visit. 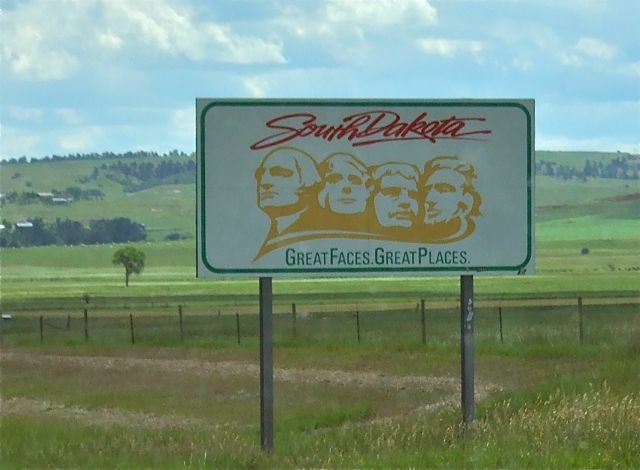 As the South Dakotans say, these are truly Great Faces. 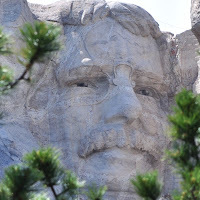 During yesterday's 295-mile drive, I kept finding myself humming the same five musical notes: Re, Mi, Do, Do, So.... By the end of the day, I was able to tie the music to its place: Devils Tower National Monument. 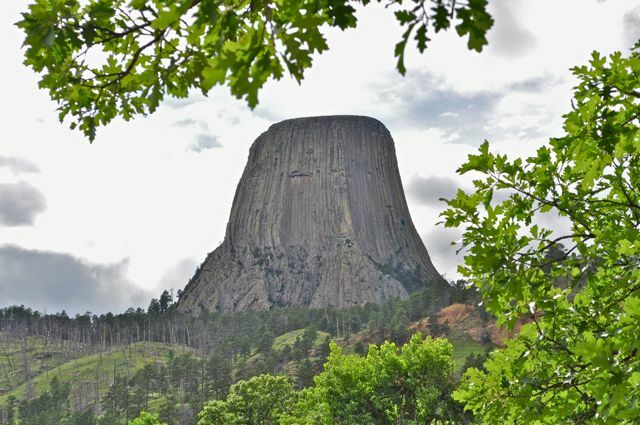 Devils Tower enjoys a prominent place in America's History, as our first National Monument. It's also earned a place in American pop culture as the alien landing pad in the climax of Steven Speilberg's 1977 classic, Close Encounters of the Third Kind. 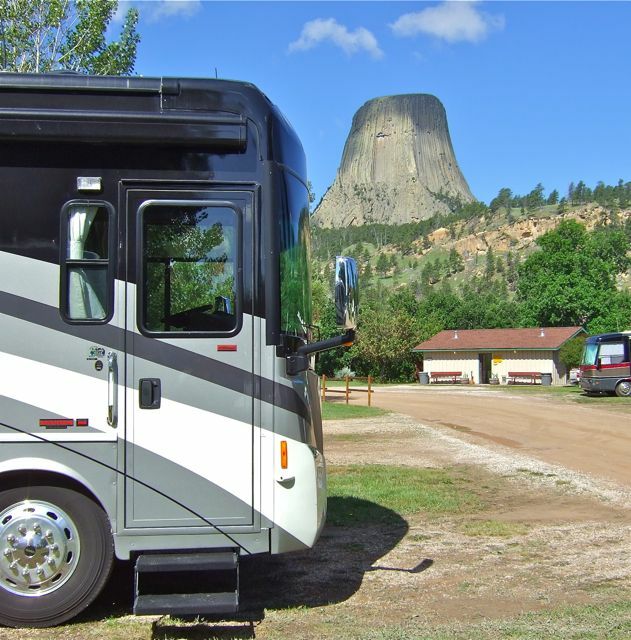 Devils Tower stands nearly 1,300 feet above the surrounding terrain, which features brillant red sandstone cliffs above the Belle Fourche River. 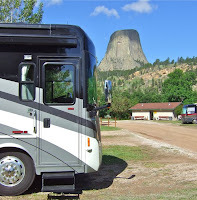 Our stop for the night was the Devils Tower KOA, which sits adjacent to the monument. See! We aren't kidding. Devils Tower was just outside our Imax window. With such an up close and personal view, we didn't even venture up to the Visitors Center. Instead, we shot about a zillion pictures of the monolith in all kinds of light. Overnight, I listened closely to hear those familiar five tones and see the colorful flashes of light, but we heard and saw nothing. No close encounters for us this time. But, this certainly was a fun and interesting stop. Along the way to Devils Tower, we coordinated a brief meet-up with our friends Dwight and Sally and their traveling companions. 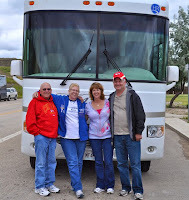 This foursome of road warriors is on their first-ever RV trip. 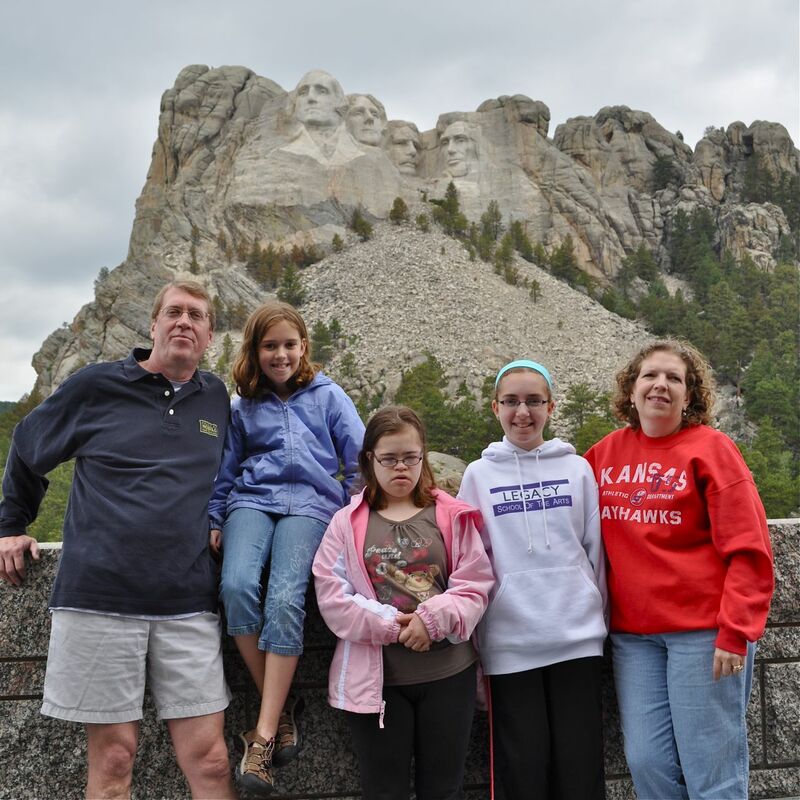 They left Kansas City a few days ago and have already visited Mount Rushmore and Devils Tower. They were headed west on I-90 toward Cody as we were headed east, so we coordinated a rest stop along the highway. They shared many stories of their adventures and misadventures, but they all have smiles on their faces. Thanks, guys, for making the time to stop and say hello. 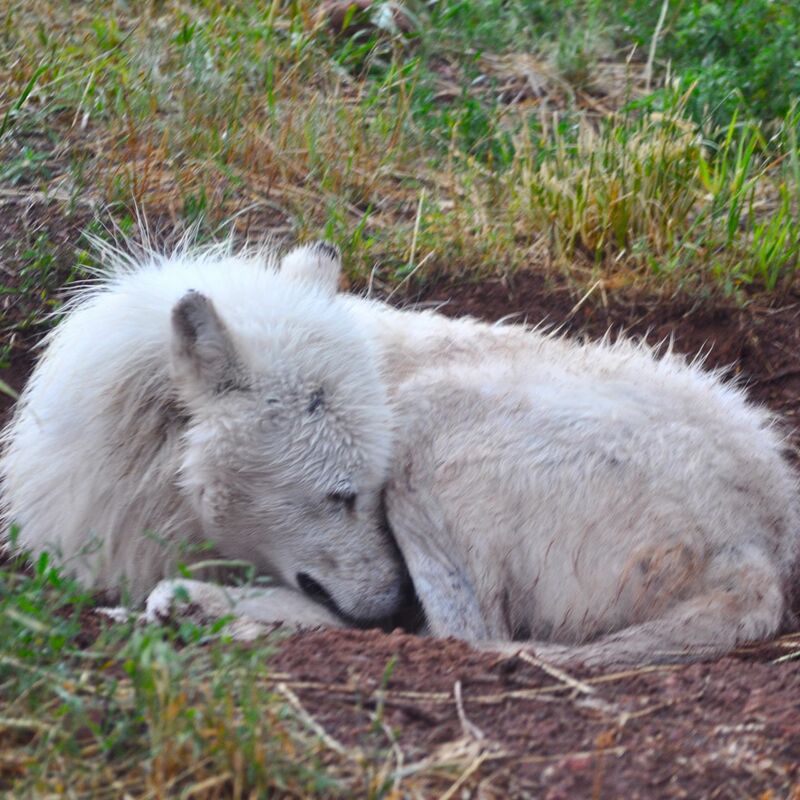 We wish you a safe, fun and trouble-free journey to Yellowstone and the Grand Tetons and home. 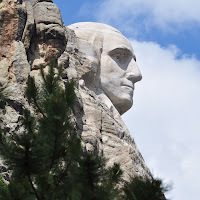 With a quick and relatively easy travel day, we made our way to South Dakota today. 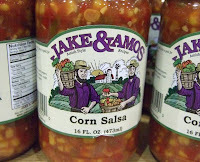 We looking forward to hooking up with family here soon and checking out those famous faces. Stay tuned. We're on the road again! (Can't you just hear Willie Nelson singing in the background?) 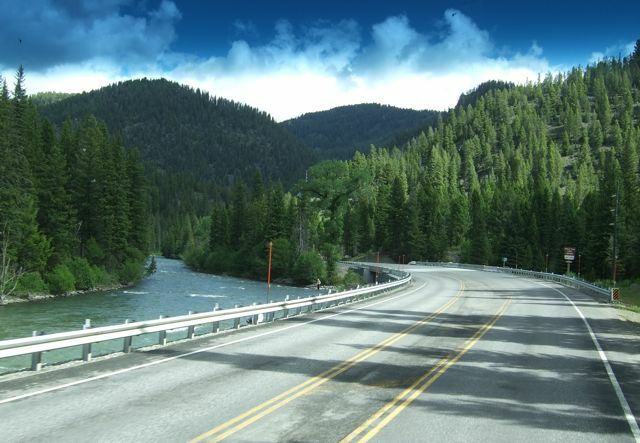 After sharing "so longs" with many of our friends at Red Rock, we headed north on US-20 toward Montana. We weren't sure how the highways would be on this last day of the holiday weekend. But, we were blessed with beautiful weather, absolutely no road construction and not much traffic at all. With almost nobody on the roads, we kept our eyes on the beautiful Gallatin River, which was a popular spot for fishermen and brave float trippers today. 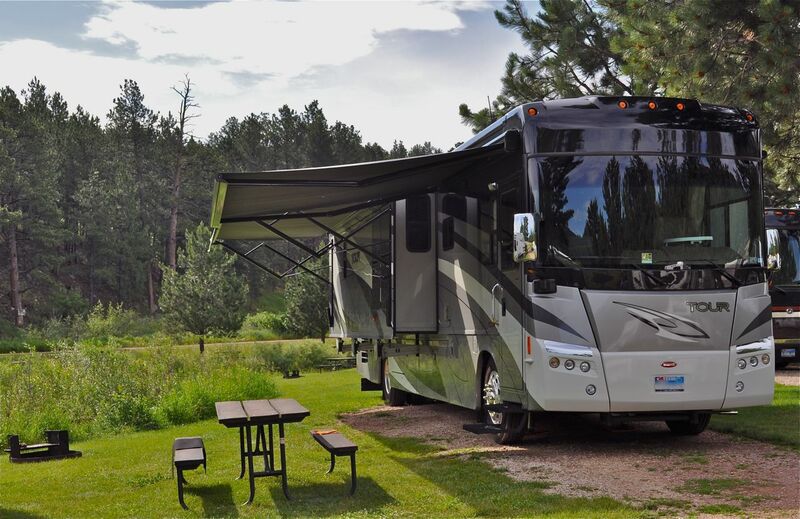 A quick 250-miles after leaving Island Park, we arrived at the KOA in Billings, Montana. 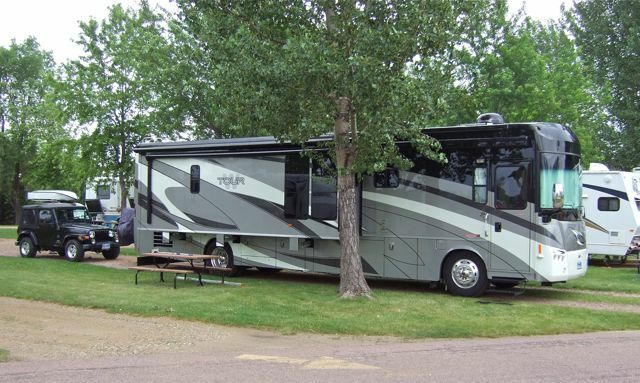 This is the company's first campground, which opened in 1961. 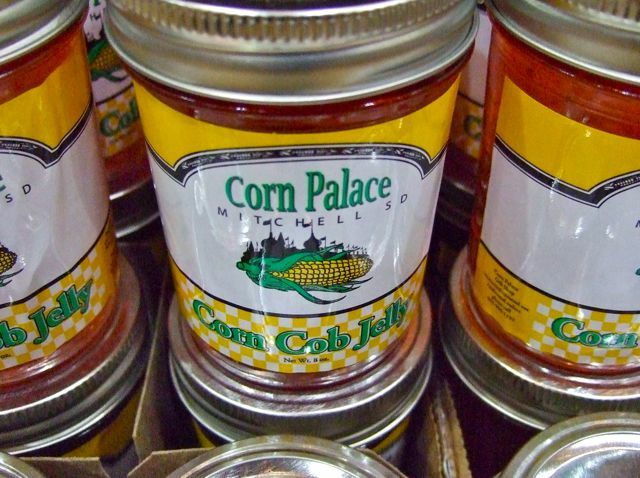 This nearly 50-year-old park is the company's flagship and is showing no signs of age. It's a beautiful spot on the edge of Billings and the shore of the Yellowstone River. 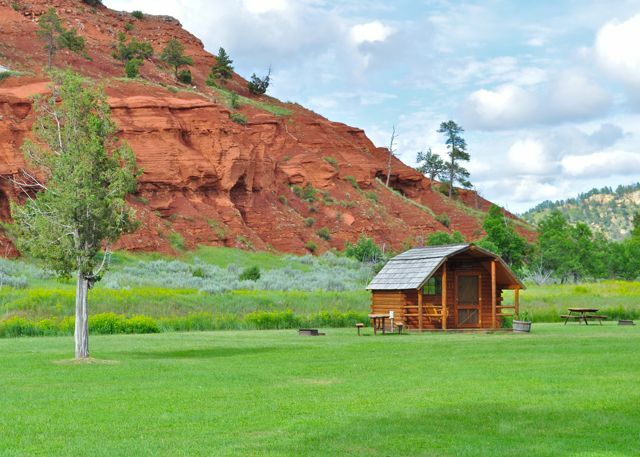 After an afternoon of stocking up on much-needed supplies here in Billings, we're looking forward to kicking back and relaxing in the world's oldest KOA. Tomorrow, we're planning a "close encounter" of some kind. 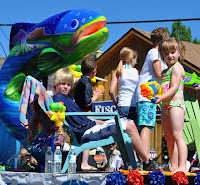 It's been years since we've been to a small town, old-fashioned, fun-filled Fourth of July celebration. 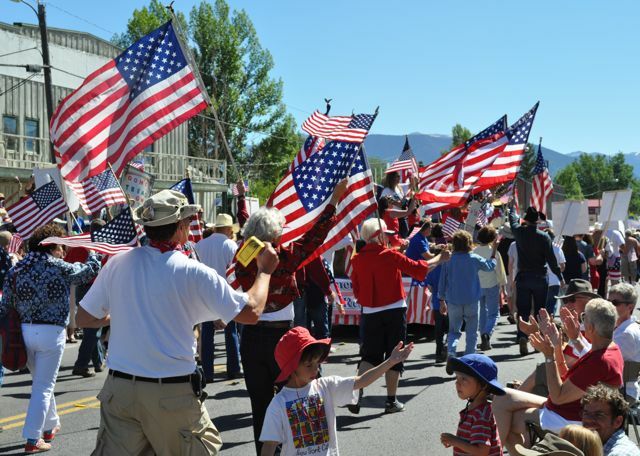 So, when Gordon and Juanita suggested we make the trip to Ennis to enjoy this small Montana town's Independence Day festivities, we were all over it! We were up and out the door early and our friends toted us some 80 miles to be a part of it all. 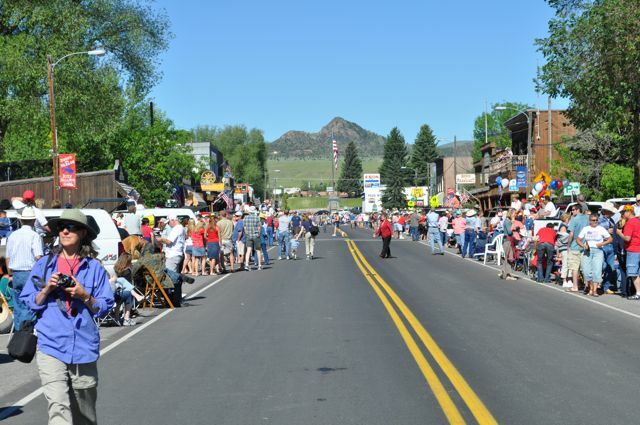 We arrived in plenty of time for the parade, and just barely enough time to find a prime spot to place our chairs along the route down Main Street. This is definitely the place to be in these parts today! While we were waiting, look what we spotted! 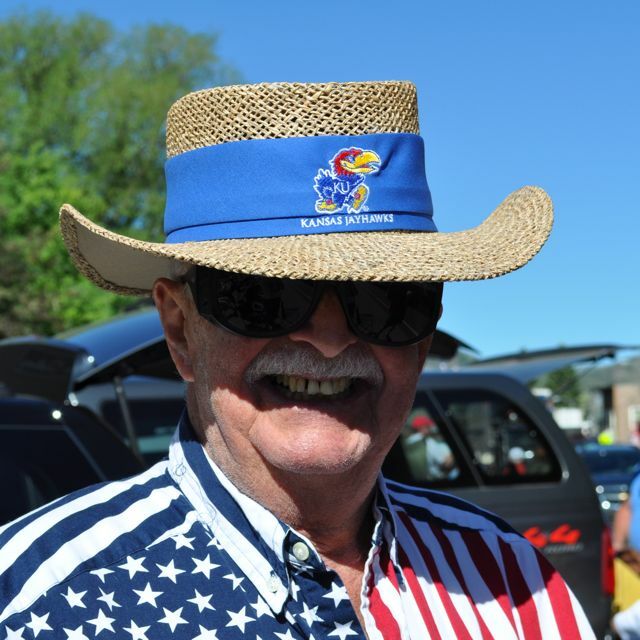 A very patriotic Montana Jayhawk! 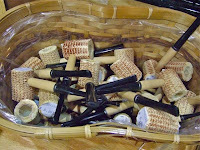 We exchanged "Rock Chalks" and had a wonderful conversation about the school we all love so much. While we were chatting, another Jayhawk overheard us and stopped by to chime in. The parade hadn't even started yet, and already the day was perfect. We had beautiful weather, gobs of red, white and blue and a flock of Jayhawks in small town Montana! 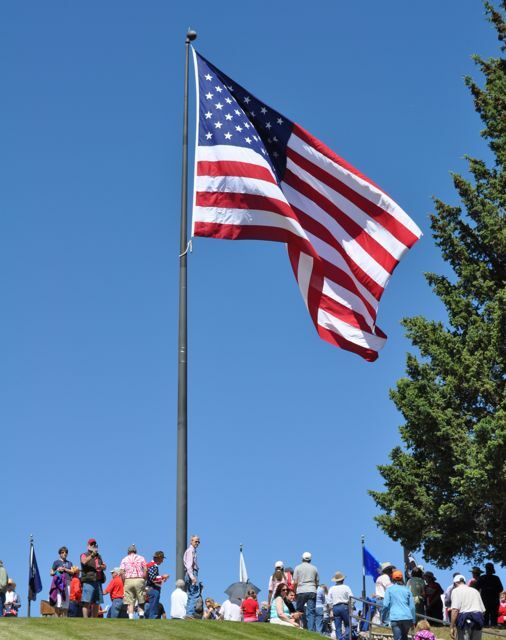 With the singing of the National Anthem, the parade was underway. 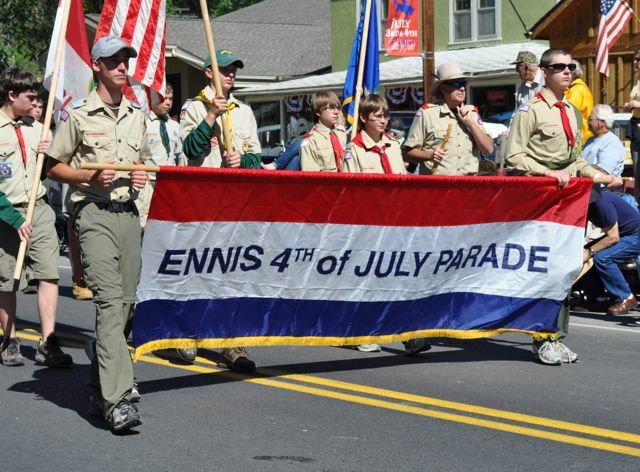 With about 1,000 residents, Ennis is definitely a small town. 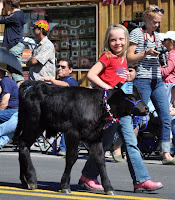 But, it definitely knows how to put on a big-time parade. 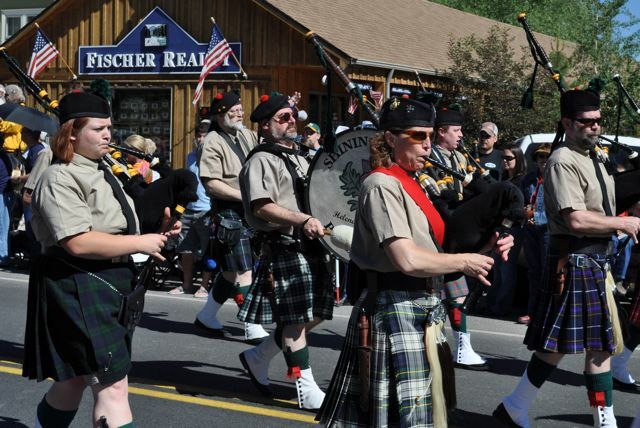 ...and not just one band of bagpipers, but two. 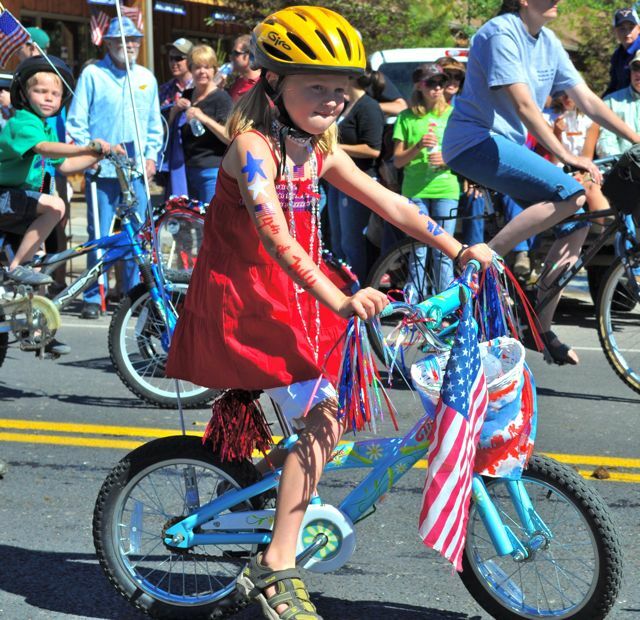 And herds of cute little ones on bikes. 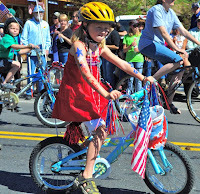 Every one was outfitted in red, white and blue, and a helmet, of course! There were even dancing kids. 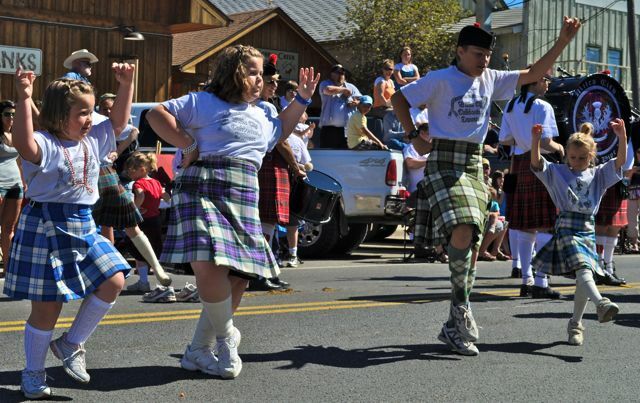 These talented little ones were with the "other" bagpipers. 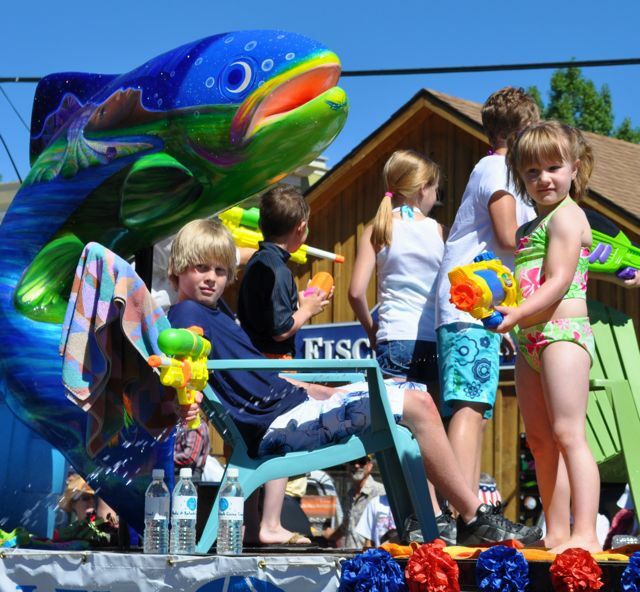 And, these colorful kids brought cool relief to the warming crowds. See that cutie on the right? Sure, she looks innocent enough. 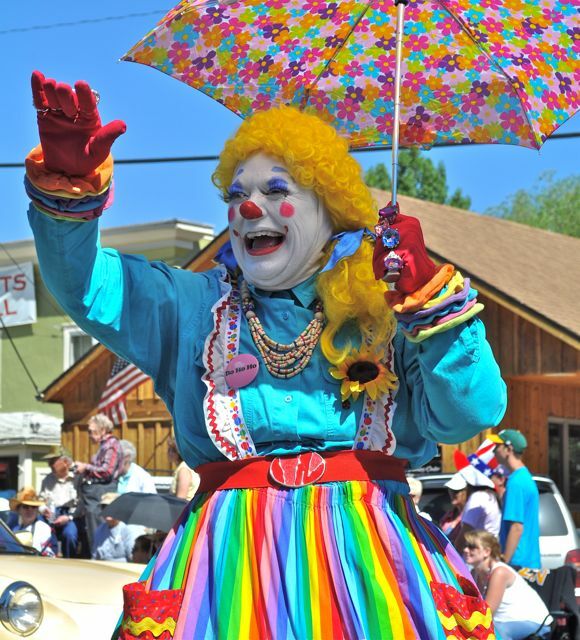 But, trust us, she's a dead eye with that giant soaker she's packin'! 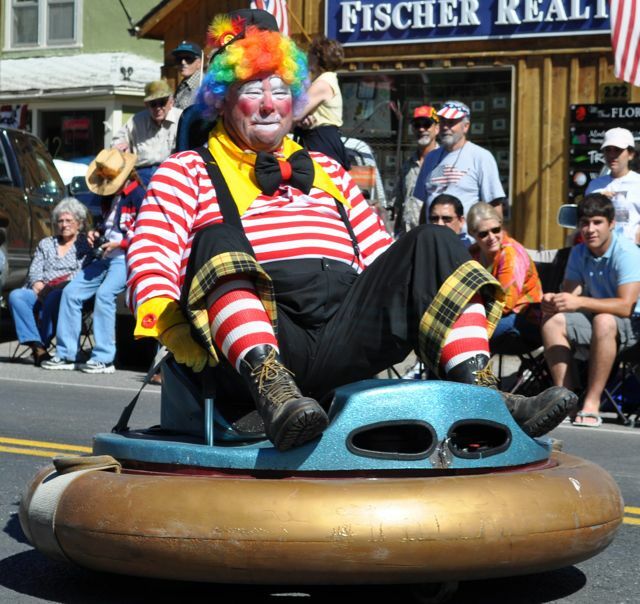 Of course, no parade is complete without clowns. 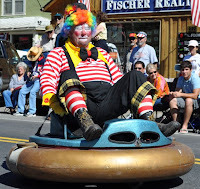 This guy was riding something that resembled a flying saucer. And, this colorful clown took time to meet and greet with the crowd. 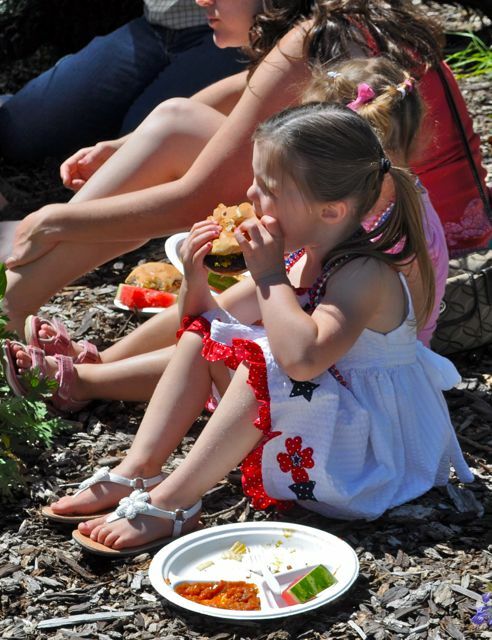 She thanked everyone for coming and wished us all a Happy Fourth. 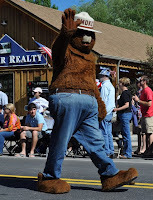 Smokey the Bear even made an appearance! 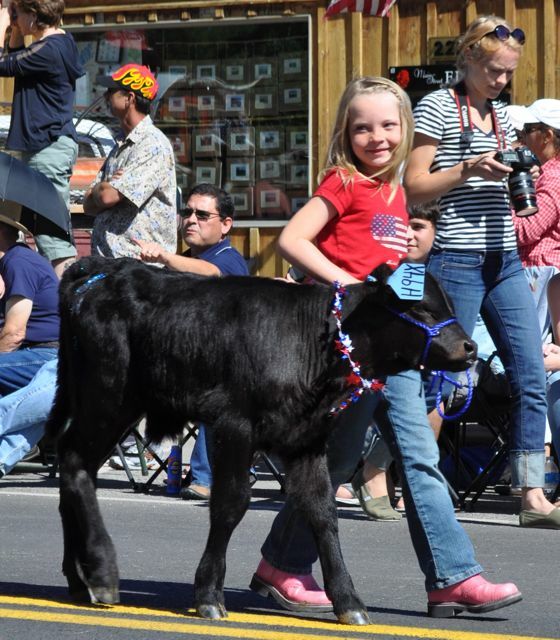 With lots of rain this season, Montana hasn't had to worry about forest fires this year. 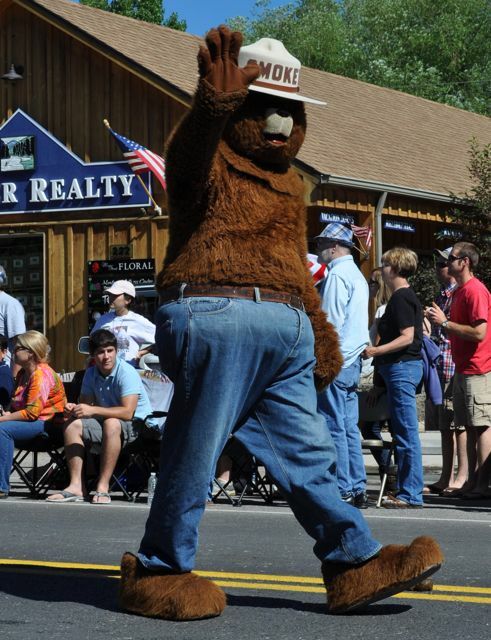 But, remember, only you can prevent forest fires! 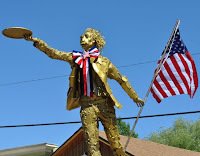 A gilded Albert Einstein made an appearance. 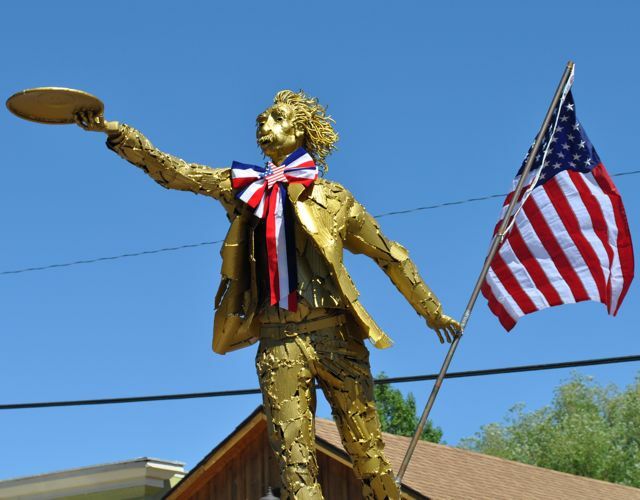 The name of this frisbee-throwing sculpture is "Albert Einstein Between Theorems". 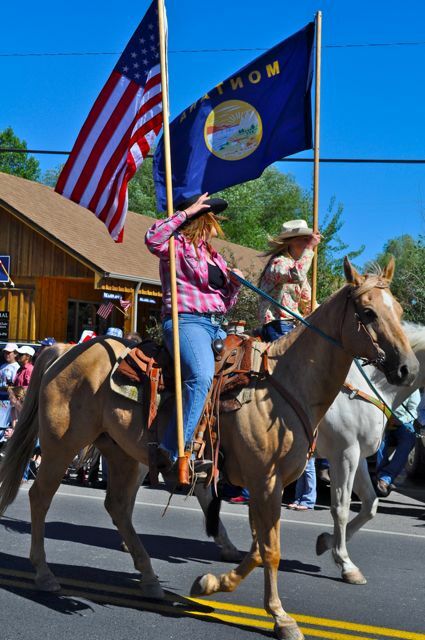 The flag and patriotic bow tie were added for the parade. 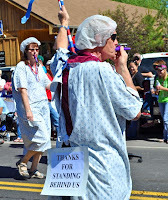 The local medical center's entry was a hospital gown-wearing, IV-rolling kazoo band! Gotta love it. It took the crowd a moment to figure out what riding in this car. Do you see it now? It's an ice cream cone! The most flag-waving parade entry was the Bozeman Tea Party. They received a big round of applause from the crowd. After the parade we made our way back through town to drop our things in the truck. We passed by a cute quilt shop where Juanita and I picked up a few things a couple of weeks ago. With our gear stored in the truck, we headed to the Lion's Club tent at the park. 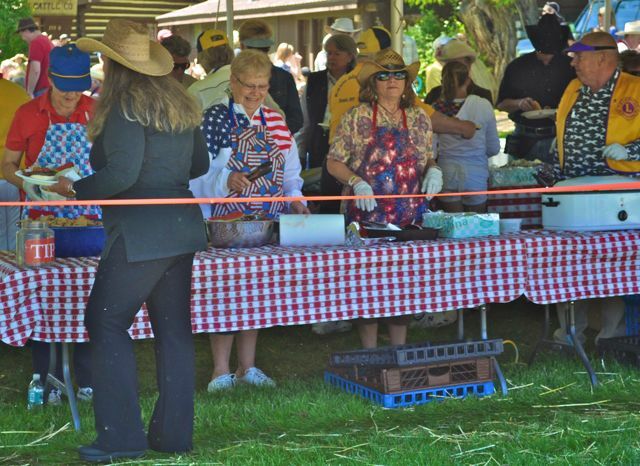 They were serving up a special Fourth of July lunch. After all of that parade watching, we were ready to chow down. After a fun lunch in the sun featuring hot dogs, burgers and traditional holiday sides, we stuffed our satisfied selves in the truck and enjoyed the scenic drive back to Island Park. 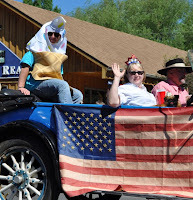 Thanks, Gordon and Juanita, for the best small town, old-fashioned, fun-filled Fourth of July celebration ever!